The serval cat is a beautiful animal that some people keep as an exotic pet. While you may be able to acquire a serval cat from a breeder, they are considered wild cats. To own a serval cat, you must create a large, secure outdoor enclosure and provide a warm environment year-round. They will need to feed on whole prey food items. You will have to provide veterinary care from an experienced exotics vet. It is important to understand the risks involved in owning a wild animal. Ownership of a serval cat is illegal in many locales and requires licenses, permits, and inspections in others. You must check with local laws to know which will apply. As well, serval cats are difficult to re-home if you can no longer care for the cat. Size: Females weigh 15 to 26 pounds; males weigh 20 to 40 pounds; height of 21 to 26 inches. The serval cat is from Africa where tall grass and bushes can hide this tall cat from its food. They are known to resemble cheetahs but have shorter tails than their larger cousins. They typically hunt where they can hide and stay near water. In the wild, they are solitary and cover a home territory of 4 to 12 square miles. African serval cats are not on the endangered species list. Having the longest legs of any cat (in proportion to their bodies), servals are agile jumpers as well as experienced diggers. They can catch birds over nine feet in the air and dig a couple feet into the ground to get under a fence. Servals make a variety of noises or vocalizations. They make a high pitched cry to call other servals, growl, make a spitting noise, purr, and more. Serval cats have been kept by humans since the ancient Egyptians and are depicted in their art. However, they are not domesticated. Breeding stock arrived in the U.S. over a century ago and you may find serval cats that are many generations removed from African imports. Even such domestically-bred servals are subject to restrictions on the ownership of wild cats and exotic animals. Breeders have also been crossing serval cats with domestic cats to produce hybrids. Savannah cats are one such hybrid and can be a choice if you like the look of the serval but need a tamer cat that easier to care for. Large outdoor enclosures are a must for these highly active and solitary cats who roam up to 4 miles a day in the wild. Being nocturnal, they are more active at night and have been known to jump out of fenced areas or dig out under fences. An outdoor enclosure needs to be completely fenced in on all sides with a top and the sides should go down a few feet deep into the ground, A simple dog run just won't do. A pool of water is also important for drinking, swimming, and perhaps even allowing your serval cat to catch his own fish in. Serval cats can bond with humans, especially if they are bottle-raised and hand-fed. Typically, they are a one-human cat and bond for life. You will need to spend time with the cat, playing with the cat on its level, eye-to-eye. They can be affectionate but require patience and a gentle hand in training. While you can try to socialize a serval, they will often remain shy of strangers and can be frightened by visitors. These cats are usually shy during the day and more active at night. Servals can be very active in play and if you bring a serval into the house, it should be in a serval-proofed cat room that doesn't have breakable objects, wires, or other hazards. While servals can be litter-trained, be aware that urinating on objects is part of their natural way of marking their territory. For safety when walking your serval you will need a special serval harness since they aren't built like domestic cats. You will need to have a plan in place for someone to care for your serval cat if you take a vacation, need a respite, or develop your own health problems. You will need to ensure you have access to a veterinarian who can care for exotic pets. Servals need the same annual immunizations and dewormings as domestic cats. While many pet servals are declawed in the interests of preventing injuries to humans, this is a practice that can result in an infection. It also makes the serval more vulnerable during confrontations with other animals. One common veterinary emergency for servals is swallowing foreign objects, which can become lodged in their throats or difficult to pass. Servals use their sight and hearing more than their sense of smell to find their prey. They often play with their food before eating it. 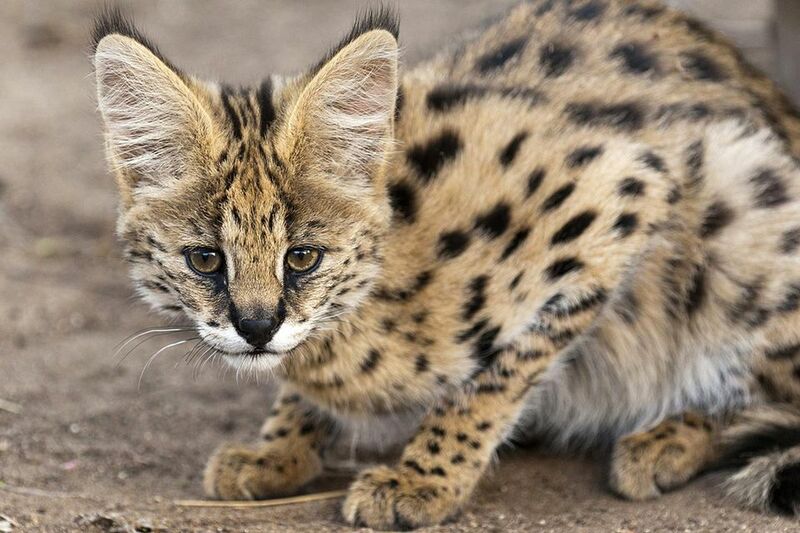 Servals are highly intelligent cats. When feeding them, a game or puzzle that makes the cat problem-solve will cause the meal to be more rewarding for them (this is called enrichment). In the wild, servals eat whatever is available, which makes providing the most natural diet as pets difficult. You may not necessarily have access to everything Africa has to offer wild servals, but rodents, rabbits, birds, fish, insects, reptiles, and frogs are all readily available to provide a varied diet of protein sources. Whole prey should be offered but don't be alarmed if your serval eats so fast that he regurgitates everything right back up. A feline supplement, such as Mazuri's Carnivore Supplement for Whole Prey, should be added to the food as well. A formulated pelleted diet is acceptable for adding to a diet but should not make up the bulk of any meal. If you are interested in a serval cat, you will need to research them in detail. Talk to other serval cat owners, reputable breeders, and exotic cat rescue organizations. Be sure that you understand the local laws that apply to this breed. Look into the many cat breeds that are available.